Signals initiated through the TCR during development can result in either survival and differentiation or cell death. High affinity signals that induce death elicit a robust yet transient activation of signaling pathways, including Erk, whereas low affinity ligands, which promote survival, generate a gradual and weaker activation of the same pathways. It was recently demonstrated that Erk localizes to distinct cellular locations in response to high and low affinity ligands. Although a requirement for Erk in positive selection is well established, its role in negative selection is controversial and, thus, the importance of Erk relocalization during development is not understood. In this study, we examined the role of Erk in negative selection using mice that are genetically deficient in both Erk1 and Erk2 in T cells. Results from three different models reveal that thymocyte deletion remains intact in the absence of Erk. The population of mature T cells is finely selected during development to express TCRs able to bind self-MHC complexes without overt reactivity toward self-Ags (1). The production of such a population derives from a two-step selection process in the thymus: positive selection ensures that only T cells with the ability to recognize self-MHC molecules are selected to develop, whereas negative selection eliminates T cells that are excessively reactive toward self-Ags. Both positive and negative selection are induced as a thymocyte encounters MHC-bound peptides through the TCR; a low affinity interaction initiates positive selection and differentiation into mature T cells, whereas a high affinity interaction causes T cell apoptosis (1). Although the distinction between positive and negative selection has been studied for many years, the molecular events that translate signals through the TCR into two divergent outcomes are still not well understood (1). Several signaling molecules such as PTEN (2), Grb2 (3), JNK (4, 5), p38 (6), Bim (7), and Nur77 (8) are necessary for negative selection, but not positive selection. Likewise, positive selection is dependent on molecules that are dispensable for negative selection including CnB (9), Ras (10), RasGRP (11), Schnurri (12), and the TCR α-chain connecting peptide motif (α-cpm) (13). This suggests that quantitative differences in signal strength can target different pathways. However, many of the same molecules downstream of the TCR, including Erk, are activated by both positive and negative selection ligands. Thus, it was proposed that the kinetics and magnitude of signals emanating from the TCR differentially induce positive or negative selection (13, 14, 15, 16). Stimulation of thymocytes with high affinity ligands induces a rapid flux of calcium and an immediate robust phosphorylation of Erk, whereas low affinity ligands lead to a gradual and smaller calcium flux and a gradual accumulation of activated Erk. In addition, activated Erk accumulates at the plasma membrane after stimulation with high affinity ligands but is localized to the Golgi following low affinity stimulation (15, 16). This suggests that the kinetics of activation and the localization of signaling molecules translate signals through the TCR into divergent outcomes. Many studies have shown that activation of the Ras pathway, culminating in Erk phosphorylation, is required for positive selection of T cells (12, 14, 17, 18, 19). However, the requirement for Erk in negative selection has been a subject of debate. Experiments with dominant negative forms of MEK or Ras, which block Erk activation, suggested that Erk was necessary for positive but not negative selection (20, 21). Likewise, deficiencies in CnB, RasGRP, and a mutation in the connecting peptide motif of the TCR α-chain, α-cpm, all resulted in reduced Erk activation and a block in positive but not negative selection (9, 11, 13). By contrast, experiments with Erk inhibitors demonstrated that inhibition of Erk blocked negative selection and even converted negative selection ligands into positive selection ligands (16, 22, 23). Yet, other experiments with the same inhibitors found that Erk was not required for thymocyte deletion (6). Thus, the evidence implicating Erk activation in negative selection is inconclusive. To investigate whether Erk is required for negative selection of autoreactive T cells, we used mice with a germline deficiency in Erk1 bred to mice with a T cell lineage-specific conditional deletion of Erk2 (17, 18). Data from three different models reveal that negative selection is not impaired in the absence of both Erk1 and Erk2. Thus, while Erk is activated during both positive and negative selection, it is only required for positive selection. Erk2fn/fn and Erk1−/− mice were previously described (17). MHC−/− (B2m−/−H2-Ab1−/−) mice were a gift from C. Surh (Scripps Research Institute, La Jolla, CA). CD4-cre and pLck-cre mice were obtained from Taconic Farms. RIP-mOVA (membrane-bound OVA under control of the rat insulin promoter) mice were obtained from The Jackson Laboratory. Thymocytes (5 × 105) were cultured with 1 × 105 peritoneal macrophages and OVA peptide (OVAp4; sequence SIINFEKL) for 18 h. Cells were harvested and analyzed by flow cytometry with annexin V and Abs to CD4 and CD8. The number of live DP cells remaining in each well was calculated. FTOC was performed as previously described (14). Lobes were removed at embryonic day 16–16.5 and placed onto nitrocellulose filters on gel foam. After 24 h, the medium was replaced with fresh medium and, after 48 h, the P815p (HIYEFPQL) and OVAp peptides were added. The following day, lobes were harvested and analyzed by flow cytometry. Bone marrow was harvested from CD45.1/2 and OT-I (wild type (WT)) or OT-I Erk1−/− Erk2fn/fn CD4-cre (DKO CD4cre CD45.2/2) mice and mixed at a ratio of 1:1. Ten million T-depleted bone marrow cells were injected into CD45.1/1 or CD45.1/1 RIP-mOVA mice that had been irradiated with 1,100 rad. For intracellular Erk2 staining, cells were fixed in 2% formaldehyde for 15 min at room temperature. The cells were spun and resuspended in ice-cold methanol and incubated on ice for 15 min. The cells were then incubated with Fc block followed by staining with rabbit anti-Erk2 (Invitrogen). The cells were washed and stained with anti-rabbit-PE and anti-CD4, CD8, and CD45.1. Negative selection of autoreactive thymocytes typically occurs as thymocytes enter the medulla during the transition from the DP to the single positive (SP) stage of development (1). As a result, efficient deletion is indicated by the absence of autoreactive SP thymocytes. Because Erk activity is essential for positive selection, mature SP thymocytes do not develop in the thymus of Erk-deficient mice even in the absence of negative selection (17). Therefore, we used a model in which thymocytes are deleted at the DP stage in response to Ag in vitro. Thymocytes from OT-I TCR transgenic mice express a TCR specific for the OVAp (aa 257–264). To obtain a population of DP thymocytes that had not received a positive or negative selection signal in vivo, OT-I TCR transgenic mice were crossed to MHC-deficient mice. These mice were then bred to mice with a germline deficiency in Erk1 (Erk1−/−) (18) and mice that had a conditional deletion of Erk2 beginning at the double negative (DN) stage of T cell development in the thymus (Erk2fn/fn pLck-cre) (17). DP thymocytes from OT-I MHC−/− (WT), OT-I MHC−/−Erk1−/− (Erk1−/−), OT-I MHC−/− Erk2fn/fn pLck-cre (Erk2−/−), and OT-I MHC−/−Erk1−/−Erk2fn/fn pLck-cre (DKO) mice were isolated and cultured with peritoneal macrophages and OVAp for 18 h. The cells were harvested and analyzed by flow cytometry with annexin V and Abs to CD4 and CD8. The number of live DP cells remaining in each well was calculated. Surprisingly, the absence of both Erk1 and Erk2 did not affect the deletion of OT-I thymocytes in vitro (Fig. 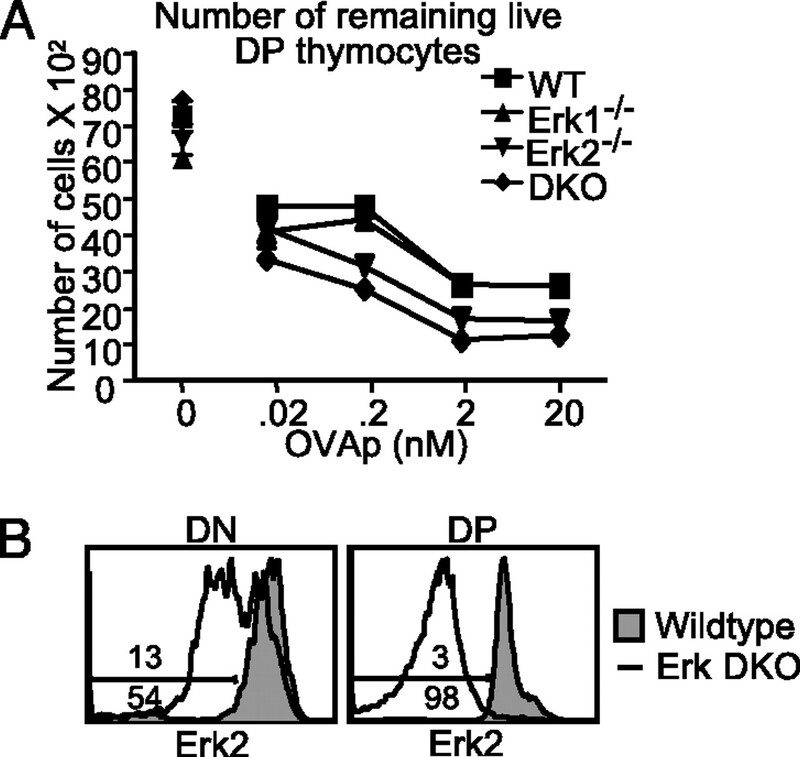 1⇓A) despite the fact that Erk2 was completely deleted from the DP thymocytes (Fig. 1⇓B). In fact, although the difference was not statistically significant, the loss of Erk2 (in either the Erk2−/− or DKO) rendered the thymocytes more sensitive to deletion, which is consistent with the notion that Erk2 is important for T cell survival (17, 24). These data reveal that Erk is not required for Ag-induced death in DP thymocytes in vitro. Erk is not required for peptide-induced death of thymocytes in vitro. A, Thymocytes were harvested from OT-I MHC−/− (WT), OT-I MHC−/−Erk1−/− (Erk1−/−), OT-I MHC−/−Erk2fn/fn pLck-cre (Erk2−/−), and OT-I MHC−/−Erk1−/−Erk2fn/fn pLck-cre (DKO) mice and cultured with peritoneal macrophages and OVAp for 18 h. The cells were stained with annexin V, anti-CD4, and anti-CD8 Abs and analyzed with a FACSCalibur flow cytometer. The number of live DP cells remaining in each well was calculated. Each condition was performed in triplicate and the average number of remaining live DP cells is plotted for three wells. These data are representative of three separate experiments. B, WT and DKO thymocytes were stained with Abs to Erk2, CD4, and CD8. The histograms depict the level of Erk2 after electronically gating on DN or DP thymocytes. The number above the line is the percentage of WT cells within the Erk2low gate, and the number below the line is the percentage of DKO cells in the gate. FTOC is another model of negative selection in which thymocytes are deleted at the DP stage of development. For these experiments, fetal thymic lobes were obtained from OT-I MHC−/− embryos such that the developing thymocytes did not encounter endogenous Ags in vivo. Lobes were removed from WT, Erk1−/−, Erk2−/−, or DKO OT-I MHC−/− embryos at gestational day 16–16.5 and placed on rafts in medium. At this time, all of the thymocytes were in the DN stage of development. The lobes were cultured for 2 days in medium to allow a sufficient number of DP thymocytes to develop. OVAp was then added to the cultures in the presence of exogenous human β2-microglobulin to allow the stable formation of MHC class I-β2-microglobulin-peptide complexes. As a control, P815p, a peptide that binds H-2Kb but does not stimulate OT-I T cells, was added to half of the lobes. The lobes were harvested 24–48 h later and the number of live DP thymocytes was calculated. Similarly as in the in vitro deletion assays, the addition of OVAp induced an equivalent deletion of both WT and DKO DP thymocytes (Fig. 2⇓, A and B). This was evident in both the percentage and the number of DP thymocytes that remained after the addition of Ag. Negative selection of the DKO thymocytes was fully intact despite the complete deletion of Erk2 in DP thymocytes from the fetal lobes after 2 days of culture (Fig. 2⇓C). These data confirm that Erk is not required for Ag-mediated deletion of DP thymocytes in intact thymic lobes. 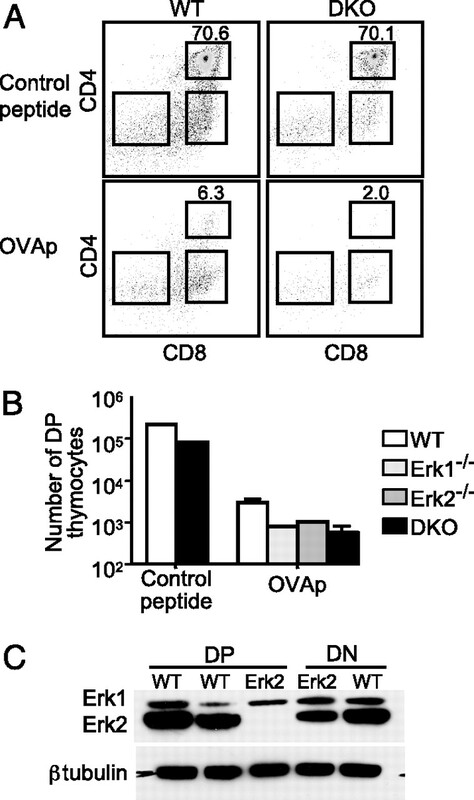 Erk is not required for Ag-mediated deletion of DP thymocytes. A, Thymic lobes were harvested at embryonic day 16–16.5 and cultured in medium. Two days later, 1 nM OVAp or 1 μM control peptide (P815p) was added to the cultures. The lobes were harvested 24 h later and stained with Abs to CD4 and CD8. The number of DP thymocytes from each lobe was calculated. Representative FACS plots of CD4 and CD8 expression are shown. B, The average number of DP thymocytes is plotted for one WT and one DKO lobe cultured with P815p and four WT, one Erk1−/−, two Erk2−/−, and four DKO lobes cultured with OVAp. These data are representative of three separate experiments. C, DP thymocytes were purified from WT or Erk2−/− fetal lobes that had been cultured in medium for 2 days. DP thymocytes were sorted on a FACSAria (96% purity), lysed, and analyzed by Western blotting for Erk1 and Erk2 (Zymed Laboratories). The data presented thus far demonstrate that Erk is not required for Ag-induced death in DP thymocytes. Whereas these experiments modeled key events in negative selection, we wished to test the role of Erk in an in vivo model in which deletion occurs during the DP-to-SP transition, the stage that more accurately reflects physiological negative selection. RIP-mOVA mice express a membrane-bound form of OVA under the control of the rat insulin promoter, which drives expression in the pancreas and kidney (25). In addition, OVA peptides are presented in the medullary thymic epithelial cells in an AIRE-dependent manner and induce deletion of OVA-specific CD4 and CD8 T cells (26). Due to the fact that OVA is not present in the cortex, deletion does not occur until thymocytes transit from the DP-to-SP stage (26). Because Erk2 is required for positive selection and the development of SP thymocytes, we bred Erk2fn/fn mice to mice expressing a CD4-Cre transgene, which is expressed late in the DN stage of development. We previously showed that in these mice Erk2 was undetectable by genomic PCR in DP thymocytes, yet the Erk2 protein was detected by Western blotting, and this was sufficient to allow positive selection to occur. However, in SP thymocytes both the gene and protein were undetectable (17). Therefore, we bred OT-I Erk1−/− Erk2fl/fl CD4-cre (DKO CD4cre) mice to examine the role of Erk during in vivo negative selection. To avoid a situation where every thymocyte expressed an autoreactive TCR, we created mixed bone marrow chimeras in which WT or DKO CD4-cre OT-I bone marrow (CD45.2/2) was mixed with polyclonal bone marrow (CD45.1/2) and transferred into lethally irradiated RIP-mOVA mice (CD45.1/1). As a control, bone marrow was also injected into lethally irradiated CD45.1/1 mice that did not express OVA. The thymi and spleens were harvested from the donor mice 4 wk following transfer, and the reconstitution efficiency of each population was analyzed. In the thymus, the OT-I population was 2–7% of the total population for both WT and DKO CD4-cre OT-I donors. The polyclonal CD45.1/2 population constituted 90–95% of the thymus (data not shown). In the spleen, cells from the OT-I donor composed ∼40%, and the polyclonal population was 31–39% of the total population. It is likely that the OT-I population was a small minority of the total population in the thymus and yet constituted a significant proportion of the spleen, because development of T cells with a prerearranged TCR was accelerated compared with polyclonal T cells (27), which caused the OT-I T cells to populate the periphery and expand faster than polyclonal T cells. Importantly, the absence of Erk in the T cells did not alter reconstitution of the chimeras. 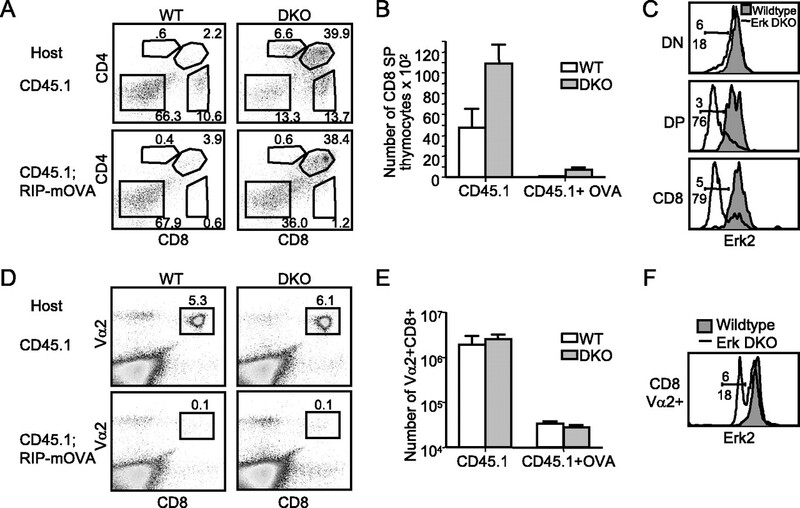 Analysis of the OT-I donor populations in the thymus revealed that CD8 SP thymocytes developed from both WT and DKO CD4-cre donor cells in the absence of Ag (Fig. 3⇓A). The number of WT thymocytes in the DP stage was decreased compared with the DKO CD4-cre thymocytes, which is likely due to the fact that a proportion of the DKO CD4-cre thymocytes lost Erk2 expression before positive selection, which blocked further development and caused an accumulation at the DP stage, whereas the WT DP thymocytes progressed rapidly through the DP stage due to the prearranged TCR (27). Nevertheless, a significant number of Erk2-deficient CD8 SP thymocytes developed in the absence of Ag (Fig. 3⇓, B and C), and <5% of CD8 SP cells were HSAhigh (where HSA is heat stable antigen), indicating that the cells were mature (data not shown). Moreover, an equivalent population of Vα2+CD8+ cells was present in the spleen of WT and DKO CD4-cre donors in the absence of Ag (Fig. 3⇓, D–F). Because Erk is required for the survival of peripheral T cells (24), the CD8+ T cells that did not delete Erk2 have a selective advantage over the T cells lacking Erk2 (Fig. 3⇓F). Regardless, the presence of Erk-deficient CD8+ T cells in the spleen and thymus allowed us to investigate whether this population would be deleted in the presence of Ag. Interestingly, the DKO OT-I CD8+ thymocytes were deleted to the same extent as WT OT-I thymocytes in the presence of OVA in the thymus (Fig. 3⇓, A and B). Moreover, of the remaining CD8 SP thymocytes, an average of 80% of the cells were HSAhigh, indicating that the majority of the mature CD8 T cells were deleted in the thymus regardless of Erk expression. This was also evident by the absence of Erk-deficient OT-I T cells in the spleen (Fig. 3⇓, D and E). Both the percentage and number of OT-I CD8+ T cells was dramatically reduced in the presence of OVA regardless of Erk expression. These data demonstrate that Erk is not required for negative selection in an in vivo model where thymocytes encounter physiological amounts of Ag at the appropriate stage of development. Erk is not required for Ag-mediated deletion in vivo. A, Representative plots of CD4 and CD8 expression on the OT-I donor (CD45.1−CD45.2+) thymocytes are depicted. B, The average number of OT-I+ CD8 SP thymocytes in three CD45.1/1 or four CD45.1/1 RIP-mOVA mice is plotted. C, The level of Erk2 expression on electronically gated DN, DP, or CD8 OT-I donor cells is shown. The number above the line is the percentage of WT cells within the Erk2low gate, and the number below the line is the percentage of DKO cells in the gate. D, Representative plots of Vα2 and CD8 expression on the OT-I donor (CD45.1−CD45.2+) splenocytes are shown. E, The average number of Vα2+CD8+ splenocytes in three CD45.1/1 or four CD45.1/1 RIP-mOVA mice is plotted. F, The level of Erk2 expression on electronically gated Vα2+CD8+ OT-I donor cells is shown. These data are representative of three separate experiments. We present data from three models of thymocyte deletion demonstrating that the deletion of thymocytes is normal in the complete absence of Erk. This confirms previous data with dominant-negative Ras and Mek transgenes and pharmacological inhibitors of Mek (6, 19, 20). We propose that the robust, transient activation and relocation of Erk to the plasma membrane in response to high affinity ligands are not events that mediate the deletion of thymocytes. Rather, as suggested by Daniels and colleagues (15), negative selection may require sequestration of Erk away from JNK or p38. We speculate that negative selection may also require the sequestration of Erk apart from Bim, as Erk-mediated phosphorylation has been shown to inactivate Bim (24, 28, 29), the major effector of Ag-mediated thymocyte death (7). As opposed to being a required component of thymocyte deletion, Erk activity may need to be avoided, possibly by relocation away from the signal transduction complexes mediating the initiation of apoptosis. It would be interesting to examine the progression of negative selection under conditions in which Erk could not translocate to the plasma membrane. This would reveal whether the absence of Erk from specific intracellular niches is important for thymocyte survival and differentiation. ↵1 This work was supported by Public Health Service Grant 5R01 AI021372-26 (to S.M.H.) and by Juvenile Diabetes Research Foundation Grant 2-2007-105 (to M.A.M.). ↵2 Current Address: St. Jude Children’s Research Hospital, Department of Immunology, Memphis, TN 38105. ↵4 Abbreviations used in this paper: OVAp, OVA peptide; DKO, double knockout; DN, double negative; DP, double positive; FTOC, fetal thymic organ culture; RIP-mOVA, membrane-bound OVA under control of the rat insulin promoter; SP, single positive; WT, wild type. Suzuki, A., M. T. Yamaguchi, T. Ohteki, T. Sasaki, T. Kaisho, Y. Kimura, R. Yoshida, A. Wakeham, T. Higuchi, M. Fukumoto, et al 2001. T cell-specific loss of Pten leads to defects in central and peripheral tolerance. Immunity 14: 523-534. Gong, Q., A. M. Cheng, A. M. Akk, J. Alberola-Ila, G. Gong, T. Pawson, A. C. Chan. 2001. Disruption of T cell signaling networks and development by Grb2 haploid insufficiency. Nat Immunol. 2: 29-36. Rincon, M., A. Whitmarsh, D. D. Yang, L. Weiss, B. Derijard, P. Jayaraj, R. J. Davis, R. A. Flavell. 1998. The JNK pathway regulates the in vivo deletion of immature CD4+CD8+ thymocytes. J. Exp. Med. 188: 1817-1830. Sabapathy, K., T. Kallunki, J. P. David, I. Graef, M. Karin, E. F. Wagner. 2001. c-Jun NH2-terminal kinase (JNK)1 and JNK2 have similar and stage-dependent roles in regulating T cell apoptosis and proliferation. J. Exp. Med. 193: 317-328. Sugawara, T., T. Moriguchi, E. Nishida, Y. Takahama. 1998. Differential roles of ERK and p38 MAP kinase pathways in positive and negative selection of T lymphocytes. Immunity 9: 565-574. Bouillet, P., J. F. Purton, D. I. Godfrey, L. C. Zhang, L. Coultas, H. Puthalakath, M. Pellegrini, S. Cory, J. M. Adams, A. Strasser. 2002. BH3-only Bcl-2 family member Bim is required for apoptosis of autoreactive thymocytes. Nature 415: 922-926. Calnan, B. J., S. Szychowski, F. K. Chan, D. Cado, A. Winoto. 1995. A role for the orphan steroid receptor Nur77 in apoptosis accompanying antigen-induced negative selection. Immunity 3: 273-282. Neilson, J. R., M. M. Winslow, E. M. Hur, G. R. Crabtree. 2004. Calcineurin B1 is essential for positive but not negative selection during thymocyte development. Immunity 20: 255-266. Swan, K. A., J. Alberola-Ila, J. A. Gross, M. W. Appleby, K. A. Forbush, J. F. Thomas, R. M. Perlmutter. 1995. Involvement of p21ras distinguishes positive and negative selection in thymocytes. EMBO J. 14: 276-285. Dower, N. A., S. L. Stang, D. A. Bottorff, J. O. Ebinu, P. Dickie, H. L. Ostergaard, J. C. Stone. 2000. RasGRP is essential for mouse thymocyte differentiation and TCR signaling. Nat. Immunol. 1: 317-321. Takagi, T., J. Harada, S. Ishii. 2001. Murine Schnurri-2 is required for positive selection of thymocytes. Nat Immunol. 2: 1048-1053. Werlen, G., B. Hausmann, E. Palmer. 2000. A motif in the αβ T-cell receptor controls positive selection by modulating ERK activity. Nature 406: 422-426. McNeil, L. K., T. K. Starr, K. A. Hogquist. 2005. A requirement for sustained ERK signaling during thymocyte positive selection in vivo. Proc. Natl. Acad. Sci. USA 102: 13574-13579. Daniels, M. A., E. Teixeiro, J. Gill, B. Hausmann, D. Roubaty, K. Holmberg, G. Werlen, G. A. Hollander, N. R. Gascoigne, E. Palmer. 2006. Thymic selection threshold defined by compartmentalization of Ras/MAPK signalling. Nature 444: 724-729. Mariathasan, S., A. Zakarian, D. Bouchard, A. M. Michie, J. C. Zuniga-Pflucker, P. S. Ohashi. 2001. Duration and strength of extracellular signal-regulated kinase signals are altered during positive versus negative thymocyte selection. J. Immunol. 167: 4966-4973. Fischer, A. M., C. D. Katayama, G. Pages, J. Pouyssegur, S. M. Hedrick. 2005. The role of erk1 and erk2 in multiple stages of T cell development. Immunity 23: 431-443. Alberola-Ila, J., G. Hernandez-Hoyos. 2003. The Ras/MAPK cascade and the control of positive selection. Immunol. Rev. 191: 79-96. Alberola-Ila, J., K. A. Forbush, R. Seger, E. G. Krebs, R. M. Perlmutter. 1995. Selective requirement for MAP kinase activation in thymocyte differentiation. Nature 373: 620-623. Alberola-Ila, J., K. A. Hogquist, K. A. Swan, M. J. Bevan, R. M. Perlmutter. 1996. Positive and negative selection invoke distinct signaling pathways. J. Exp. Med. 184: 9-18. Bommhardt, U., Y. Scheuring, C. Bickel, R. Zamoyska, T. Hunig. 2000. MEK activity regulates negative selection of immature CD4+CD8+ thymocytes. J. Immunol. 164: 2326-2337. D'Souza, W. N., C. F. Chang, A. M. Fischer, M. Li, S. M. Hedrick. 2008. The Erk2 MAPK regulates CD8 T cell proliferation and survival. J. Immunol. 181: 7617-7629. Kurts, C., W. R. Heath, F. R. Carbone, J. Allison, J. F. Miller, H. Kosaka. 1996. Constitutive class I-restricted exogenous presentation of self antigens in vivo. J. Exp. Med. 184: 923-930. Gallegos, A. M., M. J. Bevan. 2004. Central tolerance to tissue-specific antigens mediated by direct and indirect antigen presentation. J. Exp. Med. 200: 1039-1049. Huesmann, M., B. Scott, P. Kisielow, H. von Boehmer. 1991. Kinetics and efficacy of positive selection in the thymus of normal and T cell receptor transgenic mice. Cell 66: 533-540. Sabbagh, L., G. Pulle, Y. Liu, E. N. Tsitsikov, T. H. Watts. 2008. ERK-dependent Bim modulation downstream of the 4–1BB-TRAF1 signaling axis is a critical mediator of CD8 T cell survival in vivo. J. Immunol. 180: 8093-8101. Ewings, K. E., C. M. Wiggins, S. J. Cook. 2007. Bim and the pro-survival Bcl-2 proteins: opposites attract, ERK repels. Cell Cycle 6: 2236-2240.